Asghar and I are now 16 days into our $2/day/person challenge and I am proud to say that we have not spent any money eating or socializing outside. I think for the first time, in a very long time, both of us even hung out at separate social events and only had water. You may be wondering, "How do they do it?" Well it really isn't that hard. For starters, it is really important to plan ahead. Laziness is probably the only thing that prevented us from doing this before. Every Saturday, we sit and make a list of what we are going to eat for breakfast, lunch and dinner every day of the week. Doing this has really allowed us to shop for ingredients that we can keep using instead of doing what we usually do and buy one off items and then let them rot or sit there for weeks before we realizing we had them. For example, I bought carrots on Saturday so I could use them in my vegetable soup, shred them in my salad and roast them with my chicken. We even planned ahead to have a double date. Last Thursday, we had a couple over for some spaghetti and meatballs. The meal was nothing fancy but it was still delicious and filling. And we got to enjoy a great evening with friends without spending $50-$100 on dinner which is what always happens when you go out for dinner. Some of our favorite dishes have been chicken stir fry, chicken tacos, potato cutlets, vegetable soup and of course a good old loaf of bread. Asghar has baked baguettes, sourdough loaves, and white loaves. 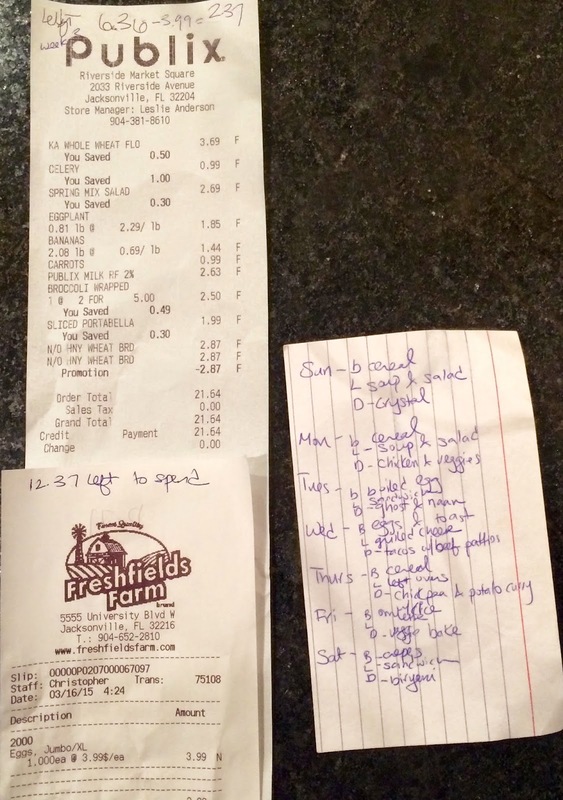 I have attached pictures of each week's receipts and our meal plans for the week. The thing that has touched me the most is being able to feel and understand what it is like for those that do not have the luxury to buy whatever they like. We might be doing this as a fun challenge but for many this is a reality. This really hit me on the morning of Friday, March 6th. It was warm most of the week and all of a sudden it got really cold on Friday. I had to be at the Mayor's education summit by 7:30 and of course left the house without checking the weather. When I got out to the car, I was freezing! But I had to deliver promotional material and could not be late. So I dealt with it and made my delivery downtown. I had a hour to kill before the program actually started so I quickly drove home and grabbed a coat. On the way home, I noticed a woman on Park St who was shivering and only wearing a t-shirt. She didn't have to ability to go home and grab a coat. That's when it hit me, I am so lucky to have everything I have and I felt ashamed because I could do nothing for her. There is a reason food drives tell us to look into our pantries around Thanksgiving. We as a society tend buy more than we need. Why not buy less, save more and give more to the organizations we want to rather than feeling like we have to give around one holiday. It has been fun inspiring others to think about what they really need to live comfortably. Now that we know we can do this, I think we might make this an annual tradition. February was a decadent month. My parents visited and brought lots of home cooked meals. Asghar and I went to Hawaii for a week and had the most amazing time, topped off by a lavish meal at Red Salt in Kauai. Upon our return, we hosted a party to celebrate my 30th birthday with our wonderful friends in Jacksonville. This was followed by a meal at Roy’s with family and then a delicious dinner at Bistro Aix on my actual birthday. Wow. Needless to say, I felt spoiled, gluttonous and a little guilty. My loved ones are wonderfully caring and know how to make a girl feel special. But it also made me feel like we have too much. It made me think back to my time in Cambodia trying to stretch my $300/month allowance as far as I could. I realized that I just don’t think about where our money goes as much as I believe I should. Yes, we save and are conscious about not incurring debt, but generally we spend our income without a purpose. So I came up with an idea and proposed it to Asghar. For the month of March, we have decided to only spend $2/day/person on food and beverages, $28/week or $112/month. We both felt like it would be fun to do this together and a great way to challenge ourselves. We have decided everything in our pantry is fair game since we barely use those items. Purists would probably consider this cheating but we are taking baby steps. Discovering the items in our pantry has actually been a lot of fun. We realized we have a lot of flour so we decided to bake our own bread. In three days, we have baked two loaves and they were delicious. One was lemon poppy and the other was a plain white loaf. We are working on our yeast starter for sourdough next. Grocery shopping has also changed. Instead of just buying things on our list without looking at the cost, we found ourselves comparing weight and costs for most of our items. On March 1st, we went to get our goods for the week and only spent $23.50 and have $4.50 left over. 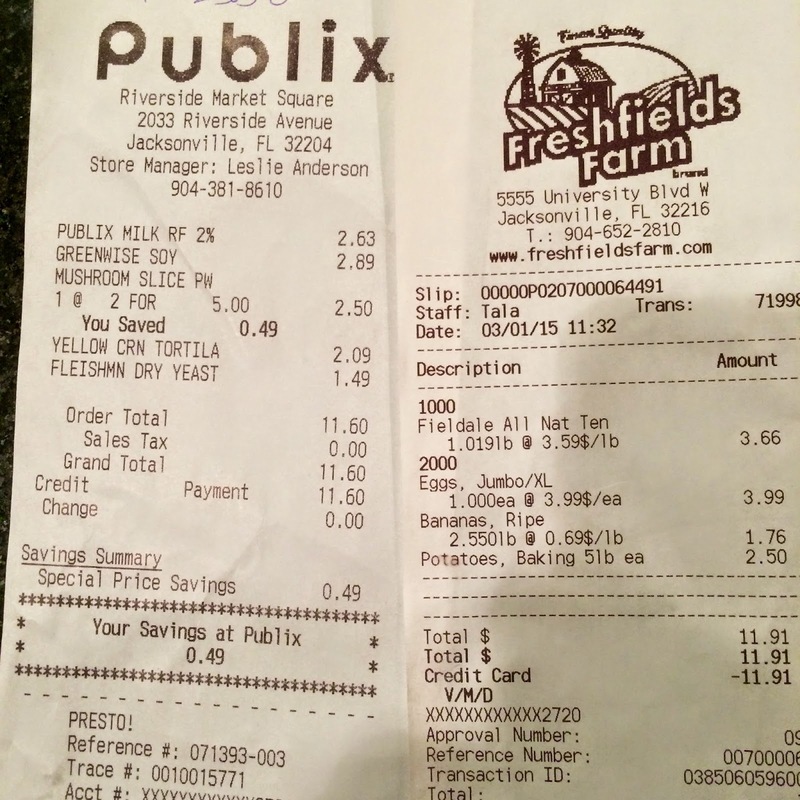 Fresh field farms was great for chicken and produce! Shopping was actually pretty easy once we decided what we were cooking for the week and planned ahead. The planning has allowed us to prepare our breakfasts and lunches for the next day in advance, which has reduced the temptation to spend money outside. We both do need our daily coffee intake. Luckily, if you remember, we won free coffee for a year from Corner Bakery. This has helped me significantly since I hate the coffee at work. The biggest challenge has been declining social invitations. We knew this would be the toughest part going in because this where most of our cash goes. Some friends get what we are doing and some don’t. Some have been really receptive and have been interested in doing potlucks and dessert evenings. But it is also really nice to have downtime at home because we can't go out. I am getting to do things I want like writing this post and working on my travel scrapbook. It may seem like a random thing to do but I am really excited about seeing how far Asghar and I can take this and what we will learn from it. I know we will be ready to go Orsay as soon as this is over but we may also only bake our own bread from now on, or learn to be a little more conscious of how much we spend. I hope in the long term we will become a bit healthier and a bit more aware of how little we need to be comfortable.